Atletico Madrid manager, Diego Simeone says Real Madrid have handled the departure of forward, Cristiano Ronaldo ‘very well’ despite losing 3-0 against Sevilla on Wednesday in the La Liga. Ronaldo left Madrid as their all-time highest goalscorer to join the Serie A champions earlier this summer in a 100-million-euro deal. 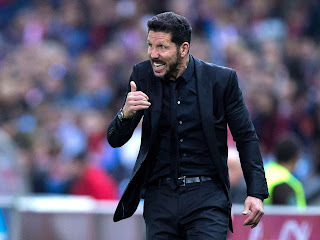 Speaking ahead of Atletico clash with Real Madrid on Saturday in the La Liga fixture, Simeone said that the Champions League holders are now a vertical team without Ronaldo. “Apart from their last game, where they faced a complicated opponent in Sevilla, who are not easy to compete against, I see a vertical Madrid,” FourFourTwo quoted Simeone as saying. “Asensio and Bale have a change of pace, [Toni] Kroos, [Luka] Modric and [Sergio] Ramos have good vision of the game and they combine well with [Dani] Ceballos and Isco.